The purpose of this study was to identify the role of emergency department (ED) design on ED staff satisfaction and performance. High patient volume, surging workloads, and violent behaviors are expected pressures for ED staff. Literature suggests the substantial role of the physical environment in the delivery of care and its role in staff and patient experiences. Nevertheless, limited studies have explored simultaneous interactions between ED physical design elements, attributes (security, wayfinding, visibility, privacy, and efficiency), and staff satisfaction or performance. Interviews, surveys, visibility graph analysis, and agent simulations were employed to understand the connection between ED physical design, attributes, performance, and staff satisfaction. Enhanced security, effective wayfinding, team visibility, noise reduction, adequate privacy, and accessible supplies and equipment were significant predictors of staff satisfaction and performance. Unobstructed views in waiting and triage and controlled entrances were critical for improving security. To improve wayfinding, eye-level signage, reducing surveillance obstacles, and creating direct public routes were recommended. Rectangular units with multiple perpendicularly connected corridors and linear pod arrangements enhanced movement. Including team rooms and enclosed ERs were recommended for privacy improvements. Visibility was critical for team communication and improved by including short-distanced perpendicular corridors and eliminating columns. Enhancing access to supplies or equipment and reducing noise levels improved the perception of staff efficiency. The findings contribute to the general body of knowledge on the impact of ED physical design on attributes that potentially improve staff satisfaction and work performance. Zamani, Z. (2018). 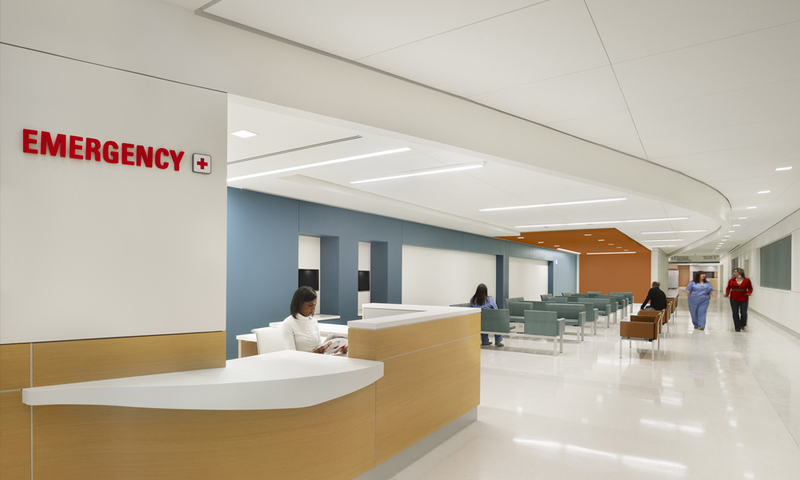 Effects of Emergency Department Physical Design Elements on Security, Wayfinding, Visibility, Privacy, and Efficiency and Its Implications on Staff Satisfaction and Performance. HERD: Health Environments Research & Design Journal.